The planet's flora and fauna now embody and serve Godzilla. Earth is a monster's planet, ruled by the largest Godzilla ever at 300 meters in height. Godzilla Earth. Human protagonist, Captain Haruo, yearns to defeat Godzilla and retake the planet for mankind. There, he meets aboriginal descendants of the human race, the Houtua tribe. The Houtua twin sisters, Maina and Miana, lead him to the skeletal remains of Mecha-Godzilla, an old anti-Godzilla weapon, which to everyone's surprise is still alive in the form of self-generating nanometal. Taken from the Mecha-Godzilla carcass, the nanometals have gradually been rebuilding a "Mecha-Godzilla City," a potential weapon capable of destroying Godzilla Earth. The human race, once again, is lost. Metphies, commander of the priestly alien race, Exif, marvels at the miraculous survival of Haruo, he begins to attract a following. The Exif has secretly harbored this outcome as their "ultimate goal." Miana and Maina issue warnings against Metphies, while Haruo begins to question mankind's next move. What is Godzilla exactly? Does mankind stand a chance? Is there a future vision in Haruo's eyes? Find out in the finale. Unable to destroy Godzilla through the use of conventional anime tropes, the constipated crew from the previous film decided to turn toward religion to summon Shenron to grant their wish of eliminating “The King of Monsters.” But they forgot one important detail: they didn’t collect the seven dragon balls beforehand. Enraged by their insolence, Shenron (i.e. Ghidorah) destroyed his believers to clear the way for his cataclysmic, multiverse bout with the reigning world champion. In a rare turn of events, Stone Cold Steve Austin decided to step in as the guest referee. Proving, once again, that unapologetic alcoholism will lead to some “golden” opportunities. The character’s are as poorly written as they are animated. None of them convey more than two emotions, nor do they come off as “real” or relatable. The ending scene where Harou decided to “crash” his spacecraft into Godzilla was as perplexing as it was stupid. The writers of this abomination, clearly, did not put much thought into developing their cast of characters in any meaningful manner. You would think that 2018 level animation would be better than this; unfortunately, you’d be sadly mistaken. The characters basic motions — like walking — look incredibly awkward (mechanical, if you will). Godzilla and Ghidorah’s battle looked herky-jerky, at best. In addition, the scenery had a lifeless texture, that expunged any element of vitality or realism. If you are simply watching this film for the “epic” battle between Godzilla and Ghidorah, then I have bad news for you: the battle was dreadful. The writers attempted to amp the viewer’s expectations by postponing the “momentous” exchanges between the two monsters until the very end. But it felt like they were extending the eventual payoff for the sake of stretching out the movie to qualify as such. Not much else to say. The movie, much like its predecessors, is incredibly prosaic, with a paucity in excitement and originality. This movie can't be a better ending to this trilogy. The story is quite better than the second one. Enjoyment: This part is quite subjective, as a movie fan this movie is quite an improvement over the last two, yes, but then, as a Kaiju movie fan, i think the movie could be a lot better. And that is the point: it is supposed to be a Godzilla movie, a Kaiju movie. So as conclusion: a real good movie but if you are a fan of Kaiju movies and battles maybe this movie will let you with a desire for more. People hating on this series for no big monster fights, well too bad this is not that type movie. Urobuchi who wrote scripts for psycho pass take the scripts for this series so you would expect ideas of dystopia, religion, technology, humanity. You would love the series if you enjoy all kinds of debates about the above topics in a post apocalypse scene, and apparently English translation on netflix is not so good either. It tries to review what religions, technology(rationality) really did to and utilize humanity, questioning the outcome of their prosperity, set up an what if that both(religion become cult)(technology become anti human and emotionless, like in terminator and stuff) if not used well would lead to destruction(creates monsters like godzilla, mecha godziilla and so). I really recommend the series to more patient watchers. 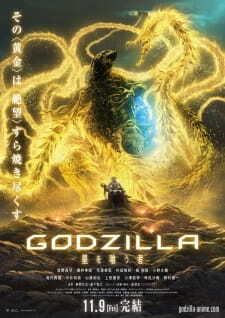 Welcome to my review to the movie 'Godzilla 3: Hoshi wo Kuu Mono'. It is the third and last installment of the animated Godzilla movie trilogy. The movies are done by Polygon Pictures and distributed through Netflix. Since they are done Polygon you can bet the movies are done in full-CGI. Lastly, this movie's runtime is about an hour and 30 minutes just so you know how much time to reserve for this. Plot/Story: The movie connects where the second movie has ended. Obviously, you have to watch the first 2 movies to even understand anything in this movie. Without going into any major spoilers: After the failed opportunity to defeat Godzilla by embracing the Nanomachines Haruo looks over his comrade Yuuko who's now confirmed braindead from the betrayel of the Bilusaludo. Not sure what to do now he is comforted by the words of his friend Metphies. Then, stuff happens. Crazy stuff. Also, yes The Gidorah appears, or does it? Now that the 'synopsis' is out of the way, let's get to the real bone. The first movie was interesting but nothing too insane happened, the seconf one was just crazy and it was really enjoyable. This one however, man...At the moment I'm reading this review I've just finished watching the movie 1 or 2 hours ago, maybe even less. It was crazy. Stuff happened and I was sitting there and thinking how insane and awesome this is. I see people saying so much bad stuff about the movies in the reviews. I do get why someone might not enjoy the movies, but I did. This one was the best one so far in terms of stuff that happened. But I tend to say that the second movie was the best out of the three. Of course no anime is flawless. (Especially if you see this quite bad score of this movie). For me, the final fight of Godzilla VS Gidorah was a tiny bit underwhelming, even though that was not the focus of the story. Believe it or not, Godzilla is not the main point of the plot. Replace Godzilla and Gidorah with similar monsters and the story would've been the same. The core of this movie lies within the characters and what most importantly the Mc Haruo and his personality and conflict with a dark spot in his heart. Hatred. The consequences he has to face to the choices he does as well as his anger towards something so enormous and powerful that he sees no way of winning over it. All this is what this movie is about and what this trilogy lead to. And I really like this. Art: Let's be honest, this is CGI. This is Polygon Pictures. Their CGI is not the prettiest. But they are still trying. I see that and I support their dedication towards that. I just hope that in a few years CGI goes to a height equal to 2D animation. We have seen how it would be in Houseki no Kuni. And if they can do it, then everyone else can as well. But the truth right now is that this movie and the other 2 are not the prettiest movies. Polygon does what they can with their current abilities, at least that's what I hope. But the CGI looks rough and blocky. It still looks too much like "made in modeling 3D graphics", if you get what I mean. Someone like me can look through that but we talking about art right now and I can't unsee, I can't look away. Sound: I feel like the sound, BGM and SFX in the second movie were way better. Maybe they've lost their cool here. Nothing stands out or feels very epic. One thing though that I have to say is that Gidorah was awesome. Characters: I don't want to go into a lot of spoilers so I try to keep it as clean as I can. First and foremost, our hero and MC Haruo. The one and only one this movie trilogy is about. Everything has always been about him. He is the one who undergoes the most character development by a large shot. In the end, everyone is there solely for his sake and to make him into the one that he becomes at the end of the trilogy. It was great. That's all I can say. Now about his friend Metphies, the only character who is left and who is remotely interesting to a degree that is worth talking about. That's it. That's all I have to say. I cannot say anything because of spoilers but he plays a big role in this. But is it an evil role, or a good one? I won't tell you. Go watch for yourself. One last thing about the end of the movie: I have seen people talk bad about them but I think they are what they are. Ignorant humans, the characters, I mean. Everyone except Haruo and Metphies fails to see the bigger picture so the act accordingly. And this again is a message, a sign for Haruo to the last act of the movie. Overall enjoyment and verdict: So, did I enjoy this movie. Frick Yes! This movie was incredibly awesome. Yes, there is stuff that wouldve liked to be different but in the end everything plays out as it should. I thoroughly enjoyed this movie and I totally recommend this trilogy to anyone who can look past CGI, if that even is a bother for him/her. A great movie. I give this movie an 8/10 for giving me a great end, but I think I prefer the second movie still. I think at some point I may re-watch this trilogy. Anyhow, that's something different entirely. Thank you for reading my review, and I hope I see you in my next review. Note: I review movies/OVA/series after they have ended, unless I dropped them.